The Delaware River–Turnpike Toll Bridge connects the Pennsylvania and New Jersey turnpikes. The Delaware River–Turnpike Toll Bridge in Bucks County has been closed for the foreseeable future for emergency repairs. A structural steel component was found to be cracked on the bridge, which connects the Pennsylvania Turnpike (I-276) and the New Jersey Turnpike. The Pennsylvania Turnpike Toll Bridge is closed during the Friday evening rush hour, as seen in this still from a PennDOT traffic cam. In a statement, the Pennsylvania Turnpike Authority said bridge crews with the New Jersey Turnpike Authority found a fracture in a steel truss on Friday afternoon. The bridge was shut down immediately in both directions, and will remain closed until the truss can be repaired. Officials do not yet have a timetable for the repair work. 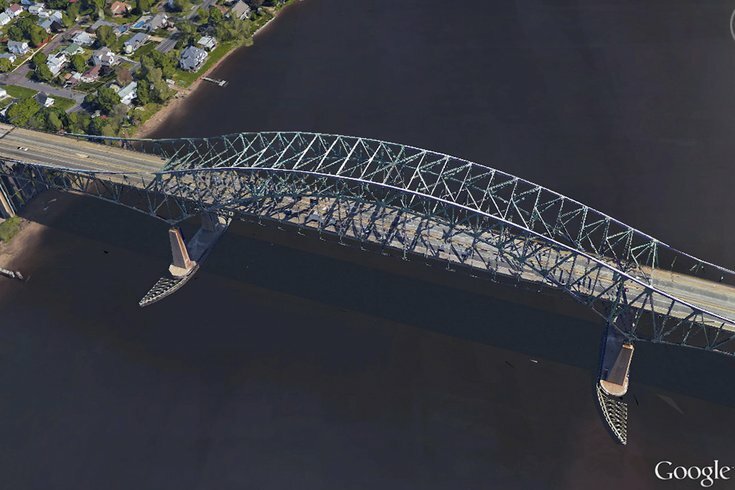 The NJTA is the owner of the eastern half of the four-lane steel arch-shaped continuous truss bridge, which crosses the Delaware River, connecting Bristol in Pennsylvania and Burlington in New Jersey. It opened in May 1956. Take the Delaware Valley Exit, #359; follow U.S. Route 13 south to PA Route 413 south, cross the Burlington-Bristol Bridge to U.S. Route 130, heading north. Take U.S. Route 130 north to Route 541 to New Jersey Turnpike Exit 5. To report an accident or other emergencies on the PA Turnpike, dial *11 on your mobile phone.